Republic is happy to provide many excellent training sessions and events. We will provide technical training for mechanical and electrical contractors, host cutting edge presentations featuring the latest and greatest products, and act as a resource for you to continue education in your industry. 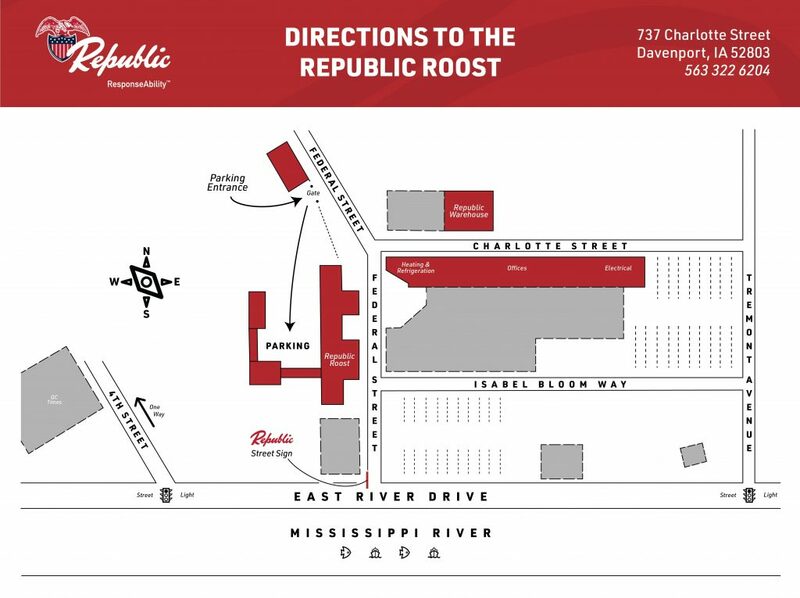 Our new, state of the art training center located at Republic headquarters in Davenport opened in November of 2016 in Republic’s iconic “Roost” area. For directions to the training center, please click the map to enlarge. Events will also be hosted at branch locations in Cedar Rapids, Dubuque, and Peoria. Check the list of events below for upcoming events and detailed information. Sign up information is available by clicking the event. You may also contact Steve Goodenough at Republic at 563-370-0253 or 800-397-6204 for more information.